In the early 90's the large recording studio was slowly becoming the thing of the past as producers and writers alike started to rely on the so called smaller Midi studios especially for their pre-production work, so as the technology grew more and more advanced and the price of such technology began to get cheaper and cheaper it opened the flood gates to the new era of the home studio or as most owners would prefer to call them 'Project Studios'. This new generation of studios would change the whole recording and in fact music industry allowing for the first time young budding singer-song writers, producers and DJ's a like, instant access to begin making, recording and having their very own hits, without the huge investment normally needed by major record labels. 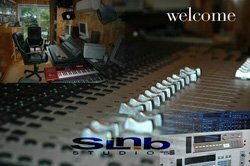 SLNB Studio's took this concept one step further and turned their studios into a one stop Production House investing in 'State of the Art' recording equipment and offering the skills of their two successful in house producers McIntosh and Charles. This proved to be a very successful partnership and still remains to date. We are a small studio but very accommodating, comfortable and fully air conditioned to keep you cool during those long hard sessions. Our studio is suitable for most types of recording but we believe that we are ideal for producers, song writers, DJ's and others wanting to use the latest tools for their pre-production, midi recording, vocal over dubbing and mixing, including the odd visual editing using the very latest video editing software. Being established as long as we have, we have at our disposal a comprehensive database of top session musicians and vocalists, all available on request prior to you giving us adequate notice. So no matter what the style of music we guarantee 100% dedication in providing you with the very best service ensuring that your music simply Sounds Like Nothing but the Best.